Sooner or later, it happens to us all. We have to pull together a nice gift for people we care about... at the last minute! We could re-gift, but somehow that feels wrong for this particular occasion. These folks deserve better. Something special. A handmade present. One of my most popular articles this time of year is the original Last Minute Holiday Gift Ideas. There are some good ideas there, so be sure to take a look. But wait... there's more. Custom DVD of a Family Event -- Nearly everyone has a DVD player these days, and most of us have burner to create them. 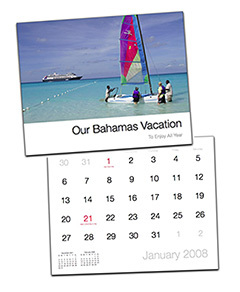 If you have a meaningful event in your photo archives, build a quick slideshow, burn it to DVD, print out a photo for the cover, and you have a custom present that will hold meaning for years to come. Custom Note Paper -- All you need for this gift is some decent paper. Design a custom note page that leaves lots of room for writing. I like to put the name of the person receiving the gift in one corner with a nice little photo or graphic in the opposing corner. Print out the sheets so you can place "2 up" or "4 up" on an letter size sheet of paper. Then trim and box. You're in business! Is shutter lag your number one concern when shopping for a compact camera? If so, you might want to take a look at Digital Camera Shutter Lag Comparison Table on Cameras.co.uk. TDS member Mark Brokering was researching this issue for a friend who wants a compact with minimal lag time. When Mark found the table, he sent me the link (thanks Mark!). Gavin Stoker writes for PhotographyBLOG., "With the PMA photography trade show just around the corner and aggressive Christmas competition driving down prices, it’s surprising what kind of camera you can buy for less than £150 / $300. Take the Nikon Coolpix P50 for example -- 8 megapixels, 28-102mm wide-angle lens, vibration reduction, ISO 2000 and face detection is an impressive feature set for this price-point. We reviewed the Nikon P50’s more expensive brother, the P5100, a couple of months ago, and while it promised a lot on paper, it failed to really wow us. Can the Coolpix P50 avoid a similar fate?" Three things jump out at me about this camera.. one, I like compacts that have the wide lens equivalent of 28mm. Combined with Face Detection technology, the Nikon P50 has the potential to be the perfect camera to capture pictures during the holidays. And third, it's a steal right now in the US, selling for $153 US on Amazon. Looking to Upgrade Your Canon DSLR? With the PMA show around the corner in late January 2008, and the rumor mills in full churn about upcoming announcements, you might want to take all of this into consideration if you're in the market for a new Canon DSLR. Canon shooters are safe in the middle of the line up. The 40D was released in the Fall, and it is as solid and highly reviewed as they come. If you're looking to upgrade from a 10D, 20D, or even 30D, you're safe to buy now. Nothing new is going to happen in January for those mid-line bodies. 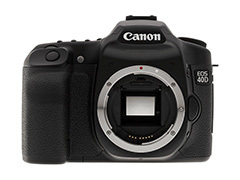 But if you're in the market to upgrade a Digital Rebel or EOS 5D, I'd hang on a few weeks. It's very likely that announcements for new versions of those cameras will come in mid-January 2008. There's no guarantee of course, but if you have the luxury of time, why not wait and see? I've done some testing with DNG files to see just how much hard disc space they save compared to Raw files. I worked with 8, 10, and 12.7 megapixel images from Canon DSLRs (Rebel XT, Rebel XTi, and EOS 5D). First thing I noticed, there are only measurable file size savings if you don't embed a Jpeg (and obviously if you don't embed the Raw file too). My original Raw file sizes were 12.1, 8.7, and 7 MBs (5D, XTi, XT) and the corresponding DNGs with Large Jpeg previews were 11, 8.7, and 7.1 MBs. Some savings, but nothing to write home about. But if I converted the Raw files without the Jpeg previews, the file sizes were a more svelte 9.7, 7.6, and 6.1 MBs each. That's fairly good savings, especially with the Canon 5D (12.1 vs 9.7 MBs) without any quality compromise. Here's a table that shows you the overview (from my upcoming book, Digital Photography Companion). 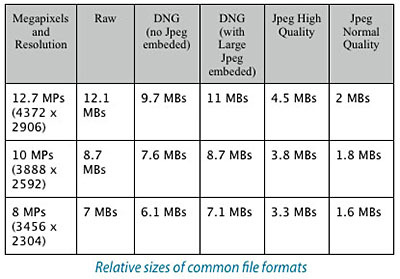 It provides you with the Raw vs DNG comparisons, and also full size Jpegs file sizes at both high quality and normal quality. Since my workflow centers around Aperture and Lightroom, I don't really see the need to convert my Raw files to DNG. The few times I have, is when I wanted to send a high resolution file with printing instructions embedded to another photographer for output. But for most of my needs, working with the original Raw files and outputting from Aperture or Lightroom to the working format I need seems to be serving me well. I was able to sit down with one of my favorite San Francisco photographers and talk about World Cup, the Olympics, shooting on assignment, and making the transition at the pro level from Kodachrome to digital. In my interview with John McDermott, we cover all of this: life on the road, Raw shooting technique, Aperture and other software packages. John is a photographer's photographer, and I think you'll enjoy what he has to say. 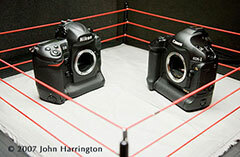 John Harrington has published a fun, informative, comparison of the Nikon D3 and the Canon EOS 1Ds Mark III. His review tackles noise issues, megapixel comparisons, tethered shooting, their LCD screens, and a host of other features. It's enjoyable reading, especially for those hungry for more information about these two flagship DSLRs. After reading the piece, the only burning question that remains is... where did John get the cute boxing ring prop? 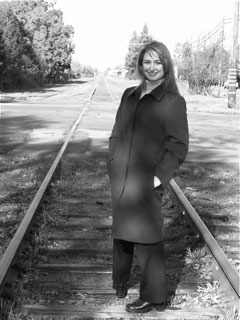 Photo © 2007 John Harrington. If you want your shots of Santa to have rosy cheeks and your tree to be vivid green, then you'll be happy to read that Datacolor has released the new Spyder3Pro and Spyder3Print. According to Datacolor: "The Spyder3Pro is a display calibration tool for serious photographers that includes the only colorimeter available on the market offering a seven detector color engine, with an aperture several times larger than other devices for increased accuracy and performance. It is designed to deliver more precise control over white point and gamma, and has easy-to-use features including a new Display Assistant that stores and easily retrieves all user device-specific information on each display to save time during recalibration." In the film photography days, I had this odd, greenish, disc that I could peer through to get some idea of how a scene would look in B&W. I never thought it was that effective, and I don't even know where the darn thing is today. Color version of the scene as I saw it while working in the field. But how would it convert to B&W? Should I make changes now? I carry my Canon G9 with me most of the time, and one of the things I use it for is to evaluate scenes for B&W conversion. It has that beautiful 3" LCD that displays images well in the field. I don't like to shoot in B&W with digital cameras per se, rather, capture in color and convert to grayscale later on the computer. That way I know I have all of the information for the shot at the time of capture, plus I have the color version too if I need it later on. But I do like knowing how a scene is going to translate to B&W while I'm shooting it. That way, I can make capture adjustments on the spot that give me a better idea of what I'm going to do later in post production. So I take a shot in B&W mode on the G9 to help me evaluate what I will have to work with later in post production. So for a few shots, I switch to B&W mode on the G9 to give me a real preview o the scene. 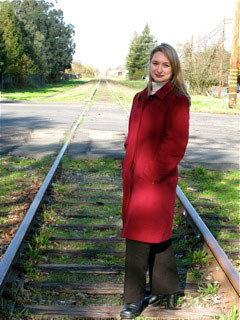 With the shot that I included here, for example, experienced B&W photographers would have guessed that the red coat would translate to about the same tonal values as her black slacks. But to see it in the field is a good reminder of some of the adjustments that I'll have to make later, or to have her change wardrobe if I don't like the look. One final note, if you shoot Raw+Jpeg in B&W mode, your camera might render all of the images in color when you upload them to the computer. Software applications tend to ignore the accompanying Jpegs (which are your B&Ws) and build the previews right off the Raws (that have all the information). If you haven't played with previewing in B&W, give it a try. You might see something inspiring that energizes your shoot... or saves it from disaster. The next time you fire up Adobe Lightroom, you'll be asked if you want to download the 1.3.1 update that is primarily a bug and compatibility fix. Adobe also released Camera Raw 4.3.1 that fixes support for the Nikon D100 and the Olympus E-3. 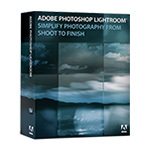 You can download both the Mac and the Windows versions of ACR from the Adobe site. Microsoft released the HD Photo Plug-In for both Mac and Windows that allows you to open and save any HD Photo file -- .wdp or .hdp -- in Adobe Photoshop. And finally, Sigma updated their Sigma Photo Pro to 2.3. This is their application for processing files captured with Sigma cameras.